Zodiac Zoom covers available in Sharkskin Plus Fabric and Sunbrella Fabric. Patterned for a specific year, make and model of boat resulting in a perfect, exact, tight fit for each boat. • Includes 12 black nylon straps with adjustable quick release buckles. • Loops double sewn in an offset “V” for strength and less strap twisting. • Trailer able with reinforcements SEWN in (not glued) at all major wear points. • Two vents included to decrease moisture and mildew build up. • Rope (NOT stretch cord) sewn into hem to pull tight to secure cover. • O/B means Outboard Motor – There is a cut out in the cover that allows the motor to be in the tilt position. 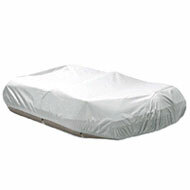 Our Sharkskin Plus exact fit boat cover is constructed from a durable 100% acrylic coated polyester. 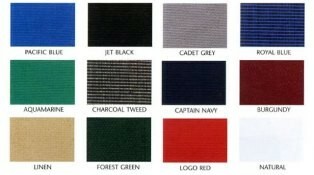 This fabric weighs 6.5 oz per square yard and is lightweight, durable, breathable, water repellent and mildew resistant. This fabric offers a 5 Year Limited Warranty and is manufactured in the USA. It is available in 10 colors. The award winning Sunbrella® fabric is made from solution-dyed acrylic yarns. This fabric is fade-resistant and stands up easily to all kinds of weather including salty air. At 9.25oz per square yard, Sunbrella fabric is one of the heaviest in the industry. Sunbrella fabric is water repellent, mildew and UV resistant. Available in 12 COLORS – Gray, Natural “White), Pacific Blue, Jet Black, Royal Blue, Aquamarine, Charcoal Tweed, Captain Navy, Burgundy, Linen, Forest Green and Logo Red. Please allow at least 2 weeks for their delivery. Covers ordered incorrectly cannot be returned. The Bravo 7M 5 liter inflatable boat foot pump comes standard with a built-in gauge meter in order to prevent over-inflation. Inflatable Boat D-Ring with 4.5'' vinyl (PVC) apron in white, black, light gray, medium gray or red. D-Rings have a vinyl pad/apron, a polypropylene strap, and a stainless steel 1.5" D-ring. Buy 4 or more and save $1.50 each. The PVC inflatable boat and raft repair kit includes 8 oz of ToobSeal liquid sealant which is the only repair kit available with all the materials required to do your own repair as well as enough ToobSeal liquid interior sealant to repair one air chamber of your inflatable boat or raft. Suitable for Zodiac, Walker Bay PVC models, and any other PVC Inflatable. Zodiac Oar and Bow Bag Button Attachment. Zodiac oar with gray paddle and handle. Fits all Zodiac Cadet model boats manufactured since 1997. All oars are sold individually, for a pair please order two. (Zodiac Part #Z6425). 35mm diameter 61" long.